What's pink or green or silver all over? 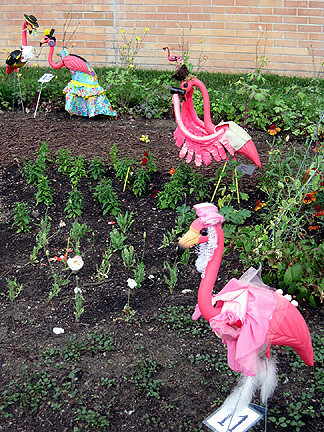 The flamingos were decorated by community members, students, and Matthaei staff. You could vote for your favorite, and this creative dragon was mine. It's made of the handyman's secret weapon (duct tape, holla Lisa!) and I liked its smile. Maybe the red protrusion is a flame, but I like to think of it as a tongue! 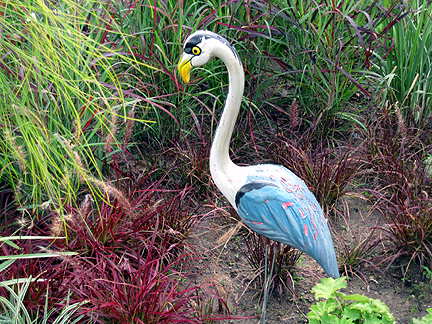 There were a lot of flamingos to admire. In all kinds of decorations. Yes, I'll be making Pinky ear muffs this winter! 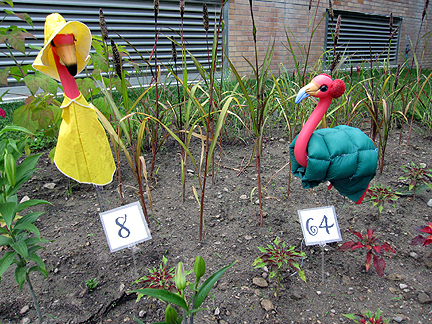 Many creations were well matched to their surroundings. I love the pink flame. Rawwwwr! I'm rough and tumble from previous fights. I keel you. ♫ One of these things is not like the others... Does provide a kind of shared context for the dragons, though! Of course we walked the rest of the grounds, too. I love the Alexandra Hicks Herb Garden. Such a peaceful setting, and people do sit down there. Delphinium, ahhhh. 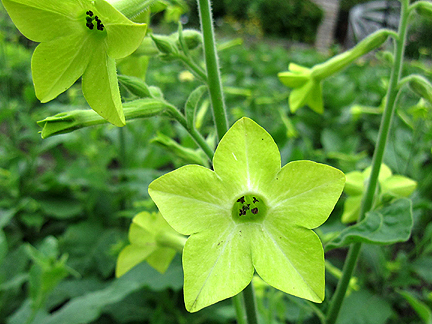 A plant that hates my garden, so I'm reduced to stalking it elsewhere. You just know I'm gonna say it: Noogie! I mean, seriously. Of course we had to go in the conservatory as well. 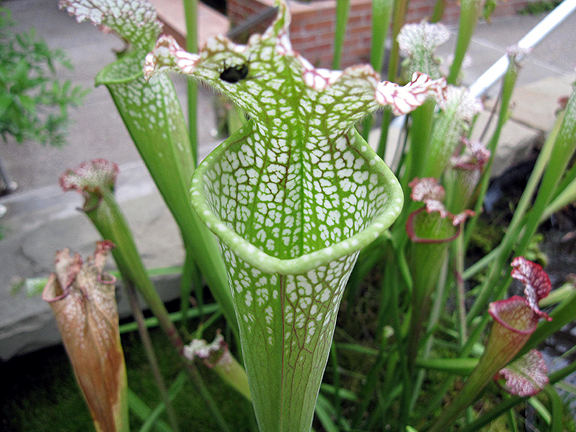 I just love pitcher plants. I think this will enlarge if you click it. 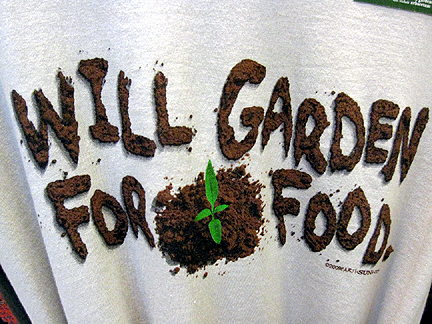 Loved the sentiment on this t-shirt hanging outside the gift shop (or perhaps that's shoppe), but was of course too cheap to buy it! I hope none of you have suffered stress-related injuries from the shock of my recent frequent updates! What fun Monica - love the flamingos! Glad you've been inspired to do such a plethora of posts lately - looking forward to catching up! 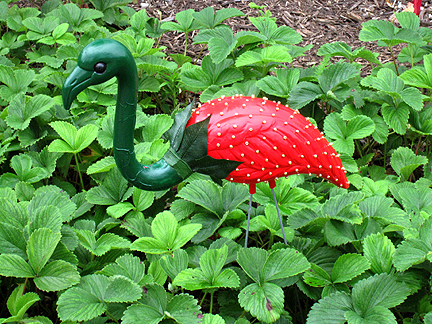 That strawberry flamingo is just too cool. 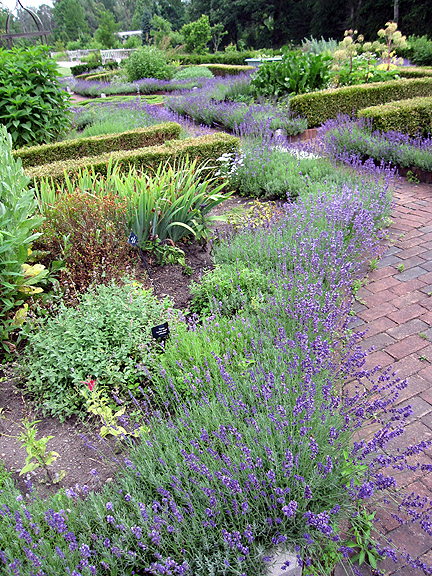 The herb garden edging is very nice too. I don't blame you for walking the grounds. 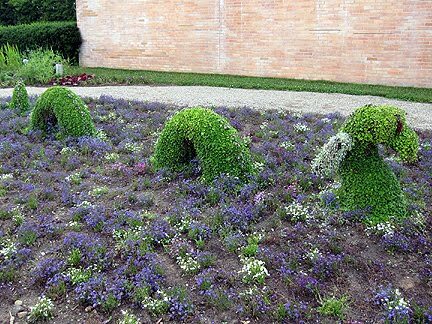 Love this garden! What a fun event. Loved the dragon also. Duct tape. Wow! Dann kann ich ja auf Deutsch schreiben... fällt mir wesentlich einfacher :o). 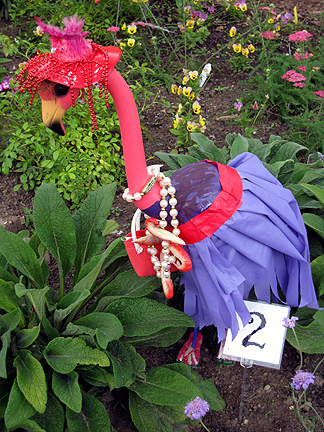 Was für eine originelle Idee mit den Flamingos! Wow, der Rittersporn (Delphinum) ist wirklich grandios. Bei mir im Garten würde es ihm schon gefallen, wären da nicht die gefrässigen Mäuler der Schnecken. Ich hab's also auch aufgegeben und bestaune ihn so wie Du in anderen Gärten. Dein Eintrag auf meinem Blog hat mich riesig gefreut. Kenne leider Buxtehude nicht oder noch nicht :o). I never equated Flamingos with Dragons before--but it works! You are a master of the duct-tape. I love his little flames of fire tongue. Love the duct tape dragon!!! Flamingos #2, #6, #7, and #13 are really cute too. 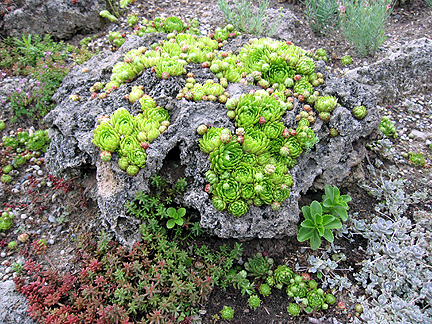 Great display of hen and chicks on the rocks. That would be fun to try. #13 and his shadow! Too good! I love flamingos - unfortunately, husband doesn't. Something about silly.... whatever. Those are great looking flamingos. Love the shirt too! Love the dragon's eye. 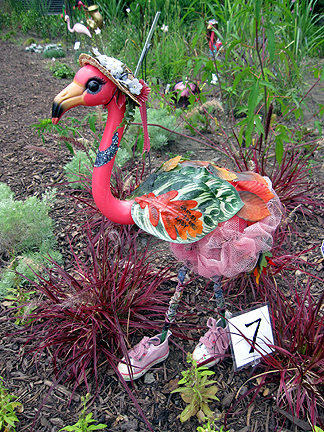 Flamingo #7 is my favorite. The last one is an imposter - that's a heron! These are all so wonderful, but the dragon is my absolute fav. The flamingos are delightful, Monica, and just the silly chuckle I needed today. Great post ... keep 'em comin'! Oh my gosh! 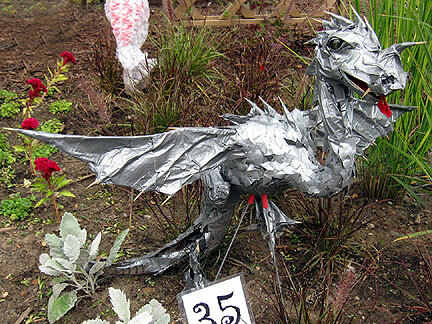 The duct tape flamingo dragon is just too cool! Love it! 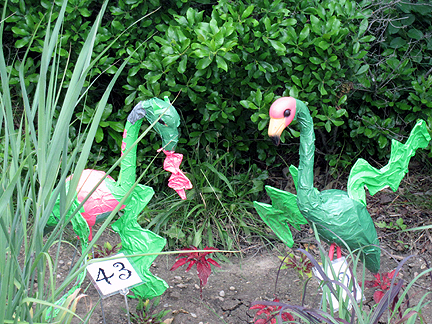 I have a thing for lawn flamingos too! You had me at the duct tape art: very avant garde! And very Alaskan, too. People have duct tape boat races and duct tape balls with gowns made of...you guessed it! 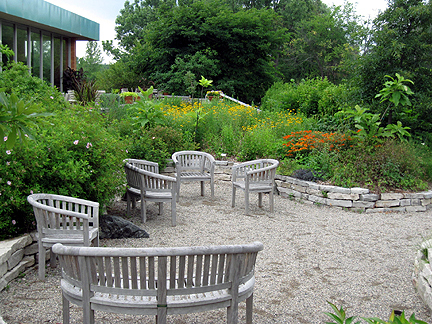 The seating area in the herb garden looked very relaxing. I wish our local botanical garden had such a nice group of chairs and benches to park. No stress-related injuries, but I'm short on time lately, so I'll have to come back to Amy's guest post later. You do go to so many interesting places, Monica! 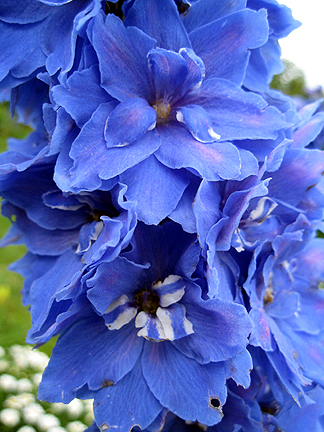 I love blue delphiniums, too, and would give anything to be able to grow them in my garden. 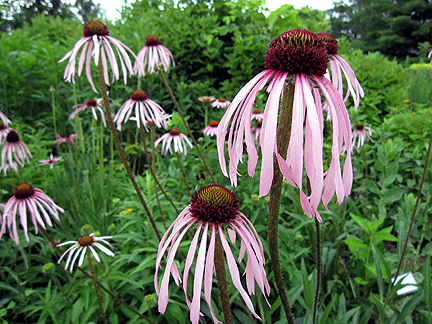 And I'll try to get ahold of some gray-headed coneflower seed for next year's seed swap. 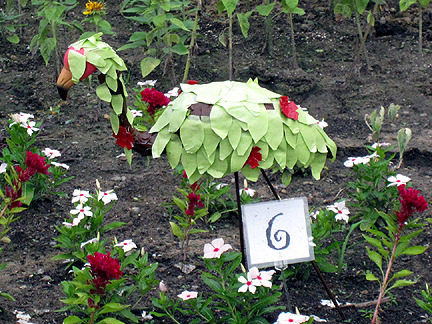 Monica what a FUN display and full of humor!Man I love the lavender shade of the herb garden! Those are pretty crazy looking pink birds! I like the dragon best. Oh, those flamingoes are so funny! They made me smile. The garden is beautiful! 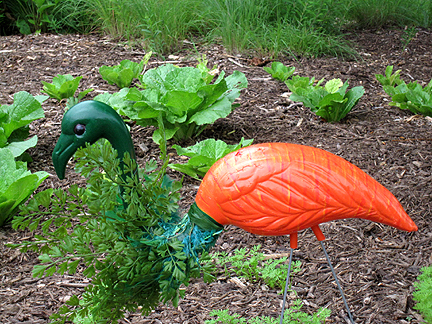 The flamingos were cool but that herb garden is amazing! 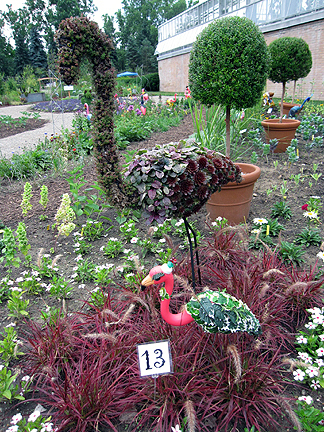 The idea of decorating the flamingos was great. They did that in Buffalo with a Buffalo figure, of course. 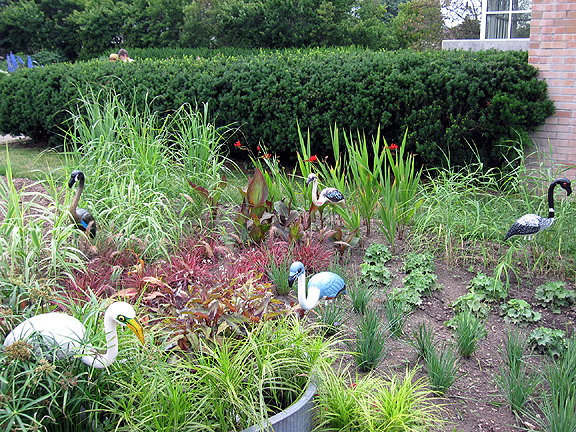 I think flamingos are cute in the garden and one of my neighbors uses them, but they are atypical, like the ones here. 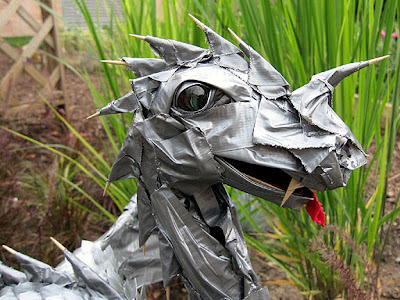 Really fun transformations and so was your duct tape dragon. Clever.